Summer Belmar vacation rentals are an ideal way for your family to enjoy one of the East Coast's most inviting beaches. Belmar, located on the New Jersey Coast, about mid-way between New York City and Atlantic City, is home to several miles of white sand beach as well as an exciting and activity-filled boardwalk. Belmar is a great place to escape the summer city heat. Surfing - Belmar is considered to be one of the best surfing locations along the East Coast. Visitors can watch the show or take a surfing lesson. Seafood Festival - Now in its 21st year, the Seafood Festival is one of Central New Jersey's most popular summer events. Held each June along Ocean Avenue near the boardwalk, the festival combines good food, music, an art show, and lots of fun. Beachside Concerts - Another summer Belmar favorite is the full schedule of outdoor, beachside concerts held each June, July, and August. Every Friday night during this time, a different jazz, rock, reggae, or other music genre performers entertain the crowd. What's more: the concerts are free. On the Boardwalk - Belmar's boardwalk extends the length of the beachfront area and is a great place to jog, stroll, and meet people. Children's playgrounds, restrooms, and sitting areas are offered every few blocks. 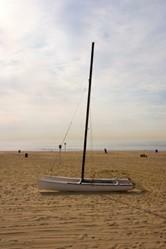 Renting a home or a condo for a beach vacation to Belmar is a great way to experience the area. Such rentals give you more room than traditional hotel accommodations and often include cooking facilities. Summer Belmar vacation rentals are offers by the week, month, or for the entire season.Amenities vary widely among properties, ranging from simple one-bedroom apartments to spacious multi-bedroom houses. Some properties even feature private swimming pools, outdoor patios and deck areas, and beach access. Other amenities and services sometimes offered are washer and dryers, high-speed Internet access, Belmar beach passes, and indoor parking. Rates for summer Belmar vacation rentals start at around $300 per week and go up from there. Few summer rentals offer maid service or on-site restaurants; instead, rentals generally come fully furnished and outfitted with linens and kitchen supplies. Guests bring their own food and personal affects. Smoking and pet policies vary among rentals. Be sure to ask the property in which are you interested about their policy. Most rentals require a deposit at the time of booking with the balance payable 60 to 90 days prior to your arrival. In most cases, payments are non-refundable unless the property is re-rented.